So far I’ve made two sets of mitts on my circular sock machine and they are quickly becoming my favorite project. There are no heels to turn and they are smaller than a sock so there is less cranking. I make a hole for the thumb using this technique and do a bit of hand work to finish them with a hand knit thumb which is a comfortable thing for me to do as a hand knitter. They have also taught me a lot about using my ribber. 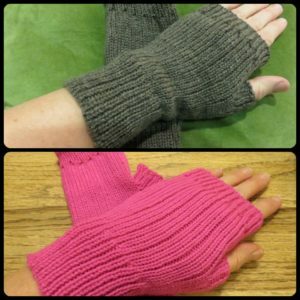 You can take a look at the checklist I developed to make these mitts. I’ve been using checklists like this for my projects because they help me remember to do all the steps for both items in a pair, and if I’m pulled away from the machine by family needs, I know where I am when I can return. Slow down! Stockinette on all cylinder needles pretty much behaves itself at all speeds as long as your tension is right and the yarn is feeding correctly. At least on my machine, when the ribber and cylinder needles start working together, I need to slow down so the yarn feeds back and forth between those needles evenly. Watch the first round or two carefully after switching needle formations. In addition to going more slowly, I carefully watched each needle close around the yarn after putting in the new needles. Although I carefully check the latches to make sure they are open, by watching each needle, I can make sure each one is going to do its job and I didn’t accidentally brush a latch closed somewhere. Learn to do the needle transfers from cylinder to ribber as shown here. At first I was using a pick tool to move the stitches and it stretches them out just enough that they were more prone to dropping. This method leaves the stitch tight on the new needle. Watch the latches carefully when switching to and from waste yarn. The other place I would drop stitches was when moving between waste yarn and project yarn because the knot would get in the way of a needle latch or the long tail pulled into the cylinder would change the angle of the yarn. So I’ve learned to watch those areas carefully and help the yarn into a latch if it misses. Last weekend I taught a class on learning to knit socks. One of the things I love about socks is how they are so easy to customize and that even a plain sock can be interesting to knit. I gave my students a list of favorite sock knitting books, so I thought I would share them here as will with some additional annotations. This is not strictly a sock book but rather a book of humor and recipes for knitting a variety of items including a great chapter on knitting basic top down socks. What I love about it is the conversational style that Stephanie uses to describe the process of making a sock and how she shows that you can’t really do it too wrong. I’ve tried to model my class a bit after her style– that socks are something that can make sense and everyone can do it! This book is sort of the opposite in some ways to the previous book. It’s a very detailed and precise explanation of exactly how to make a perfect fitting sock with tables and charts for knitting both top down and bottom up socks with measurements and stitch counts ready for you to plug into a master pattern based on your gauge. It includes some variations on heels, toes, and leg styles and has extensive information about how to make a sock for all kinds of special fitting situations. Kate has a very scientific approach to sock making. This book is a compendium of a wide variety of heels and toes and construction methods. It contains a collection of charts with numbers for different sock sizes from children to adults in a standard sock gauge. You can mix and match your favorite heels and toes with the standardized numbers included. It also information to help you decide which methods to use based on the shape of your foot. Similar to The Sock Knitter’s Workshop, Lara’s book describes a wide variety of toe and heel variations, including some that are not part of the book above. Lara’s book does not give as much information about sizing and construction, but is a great resource for exploring new methods.